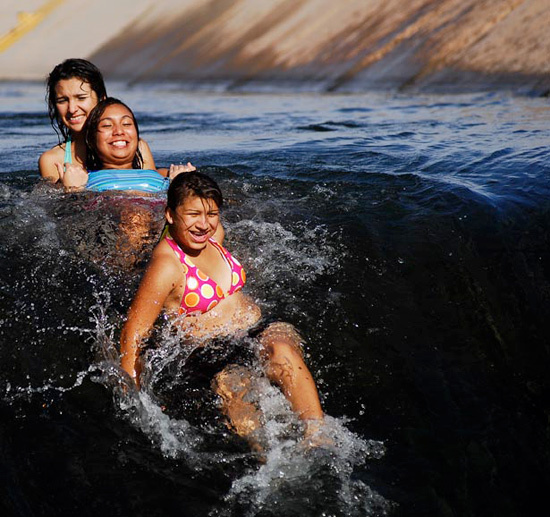 The Sun staff photographer Jared Dort saves a boy's life in Yuma, Arizona. 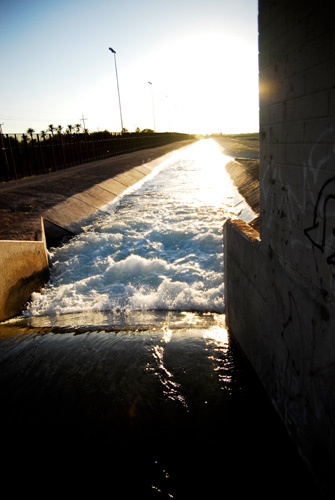 A waterfall-type area in the canal with a group of teenagers going down it was something Jared Dort had not seen in Yuma before. As photographers, we like to stay out of the news. We're behind the scenes, not too far a way from the action and not too close as to draw attention. We're there when the accident, the fire, the murder already happened. Always in the back. Rarely do we arrive beforehand. Earlier this month, I arrived early. I'd like to say it was the start of a special day, but it wasn't. My wide-zoom was broken. My tire needed to be fixed. I sucked up my first a.m. assignment. The Mexican-American border blockade put on by a group of protesters angry about electric rates in San Luis Rio Colorado Mexico turned out to be not all that angry. I hadn't made a meaningful image in two weeks. July 9th seemed like July 3rd, or June 24th. They all blended together. My new wide-zoom wasn't that wide - a 35mm to whatever found in the drawer of lenses past. The D1s where there. I got past the zoom. What really bothered me was I needed something with meaning. My shift ended early that 9th day of July. I went home, had dinner and enjoyed some family time - they've only been here in Yuma for one of the three months I have. Then I decided to hit the road back down to the border and hopefully do better. I called my a.m. assignment to re-shoot it. I got there early and decided to check on the border. We hadn't got an update so I parked at Friendship Park - the place to park when crossing the border from San Luis, AZ. When I parked I noticed some heads bobbing in the canal that runs parallel to the border fence. Must be kids. Nothing at the border. While walking back to my car after my portrait redo which went a lot better, I saw a few more heads over the hill, so I hopped in my car to check it out. I'm always looking for features. I drove down the hill, onto a dirt road that took me past a border patrol agent and a set of high-powered lights. I'm right by the fence. After realizing I took the wrong part of the road I went back up to the paved street and was going to forget about it. Looked like kids swimming in the canal and since it's summer, I've shot plenty of kids swimming. For some reason, I turned back around. I needed something good to finish out the day. Vanessa Lin (left) is shocked to see what happened to her little brother at the canal by the US-Mexico border. The boy had his foot caught in a rope while coming down a ramp in the water. A waterfall-type area in the canal with a group of teenagers going down it was something I haven't seen in Yuma, and wouldn't have seen had I not saw over that hill. So as not to be creepy (a lot of people watch Dateline), I went up and said I'm Jared from the paper and started snapping. Not only did I get to see something new, but I also found a place nobody at work had ever seen. The group was having a blast - four guys, three girls and a little boy (two guys in a car showed up later) and I was just happy to get a redeeming image. I was done. My last frame was the guy group walking back up the sandy hill and I was pleased. Then the 10-year old made his first trip down. I didn't see him in my viewfinder, but out of the corner of my eye, I saw it. He came down and stopped, right where the water turned into a white-water type rapid. The girl's laughter behind me stopped. It was now screams. The boy's foot was caught on a rope. I didn't know what to do at first. As a photographer, I'm arriving when the help is already there. I looked around. No help. This was not a joke, which was my second thought. I had to do something. Seeing that the rope was upstream, I ran up the hill and looked for where it was tied. The current was so strong where the boy was at that he kept going in and out of the water. The rope was tied very well around a metal square on the side of the canal, and also somewhere wrapped around his ankle. I couldn't get it off. The boys up top had no idea what was going on down below. One of them came over to see why I was in the canal too. If this rope didn't come off, he was either going to lose his foot, or worse, drown. I kept at the tangled rope and finally got a part loose. It was tied in three places. The boy went down stream and was caught by the girls. The ramp in the canal. They were still screaming. The rope cut into his foot, down to the bone, all the way around, and he was bleeding. The guys pulled him out and carried him to the other side of the canal. I grabbed a shirt and tossed it over to wrap-up the wound. It was bad. We needed help. I called 911 but was on International Roam and calling Mexico. No English, no help. Then I remembered the border patrol agent who met me when I turned around. He was up the hill between the border fence. I flagged him down. He had a first-aid kit, something I will have in my car tomorrow. A knife in my camera bag is No. 2. He called an ambulance and all was good. I helped save a kids life and felt good about it. What I didn't feel good about was grabbing my camera and snapping off a few frames. The boy's sister saw me and wasn't pleased. She was his responsibility that day and no doubt she felt awful. My responsibility kicked in and I got the picture, and I didn't even think twice about doing it, regardless of how I felt. I'm still a photographer. It ran Page One of the Yuma Sun the next day along with my mug. I tried to keep it a secret and just submit the photo. I didn't think it was a big deal. The publicity this story got was a little too much to take in. It made it through Photo District News, SportsShooter.com and NPPA Region 10. I don't talk about myself very often, so this was new. I'm sure any one of you reading this would have done the same thing I did. I almost didn't go to the canal that afternoon, I just happened to catch it out the corner of my eye. Truth is, I shouldn't have been down by the border at all. I should have been home, satisfied with my run-of-the-mill photos I submitted, watching X-Files on DVD with my wife. But I wasn't. I needed something with meaning. I got it that day.